Check out the latest savorfull on My Subscription Addiction! Savorfull Review September 2012 – Monthly Allergy Free Subscription Box! New Monthly Subscription Boxes – Savorful – Allergen Free Food! Cheap Subscription Boxes: 15 You Can Try for $5 Or Less! "FYI: The 20% off code takes an additional 20% off the July box that's already marked down. 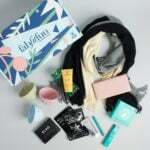 Also, off topic, b..."
The Clean Beauty Box Sale – 20% Off Past Boxes! Boxycharm Limited Edition Skincare Box Spoilers #5 & #6 + Launch Date! "Thank you for pointing out the “chemical free” deception. It drives me crazy too."